For N.O.A, the onward march of time is about far more than just units of measurement. It is an opportunity to draw upon the past, to live the present moment and to look to the future by evolving towards ever more daring and luminous horizons. The brand is an inspired dreamer that constantly innovates in presenting the new face of its Evolution: Evo. The watch takes the signature N.O.A three-dimensional effects to new limits by introducing a ceramic rotating bezel underscoring the architectural two-part case construction. 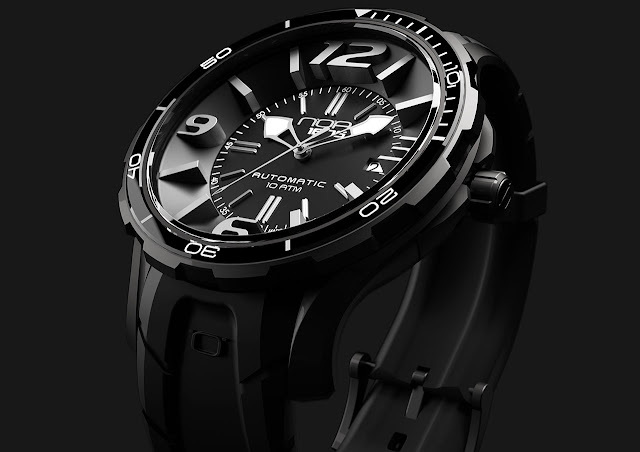 Further enhancing these depths effects, the dial is also composed of several layers, with a lower part rimmed by a minute track and date display, while the inner bezel ring creates a multi-level impression with numerals and hour-markers that appear to be literally bursting out of the watch. At its heart beats an automatic movement that may be admired through the sapphire caseback.